Debido a restricciones por parte del fabricante no podemos enviarle este artículo. FlipBelt products to the European Union. The Classic FlipBelt is a comfortable running belt alternative to running armbands for those runners that don't particularly like the armband or pouches. 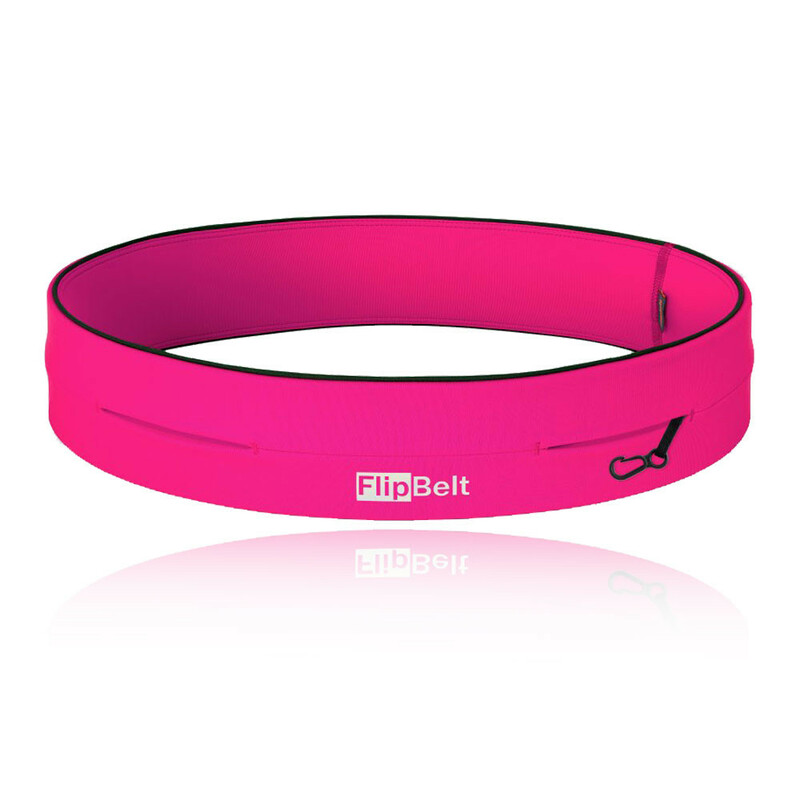 The FlipBelt is specifically designed to sit flat and securely on your hips without bouncing or riding up. With no buckles to pinch or cause uncomfortable chafing, simply pull FlipBelt Classic on like a pair of pants, place over or under your clothes and easily slide in your stuff through the multiple openings around the belt. The sleek, tubular design of the FlipBelt Classic allows you to easily, comfortable and securely carry everything you need while running, hiking, biking, working out at the gym, travelling and more. The moisture management fabric that is added works endlessly to wick sweat and excess moisture as it's produced. Once wicked the system transfers the moisture to the outer layers of the fabric where it can be easily evaporated, keeping you feeling cool, dry and comfortable. Furthermore, the fabric easily stretches to fit large phones like the iPhone 6 Plus and Samsung Note 5 while also giving plenty of room to store keys, cards, IDs and small medical devices. Turning the belt over closes all openings and further secures your essential and valuable items in place. Flat seams and piping construction eliminates the chances of chafing and skin irritation, allowing you to feel comfortable throughout your chosen activity. Additionally, the stitching used features maximum stretch and recovery which in turn allows you to move and stretch without encountering any restrictions. Lastly, The construction has been carefully thought of and the width and tube design is perfect providing minimal movement and bounce to prevent any distraction from getting in the way of your workouts or daily activities. Please take note of the following size guide. The Flipbelt comes in five sizes. As with all running belts and workout belts, to get the most out of your product, you need the right size. The right size will ensure that the belt doesn't bounce or ride up. A comfortably snug fit is what Flipbelt recommend to everyone trying on their running belt. 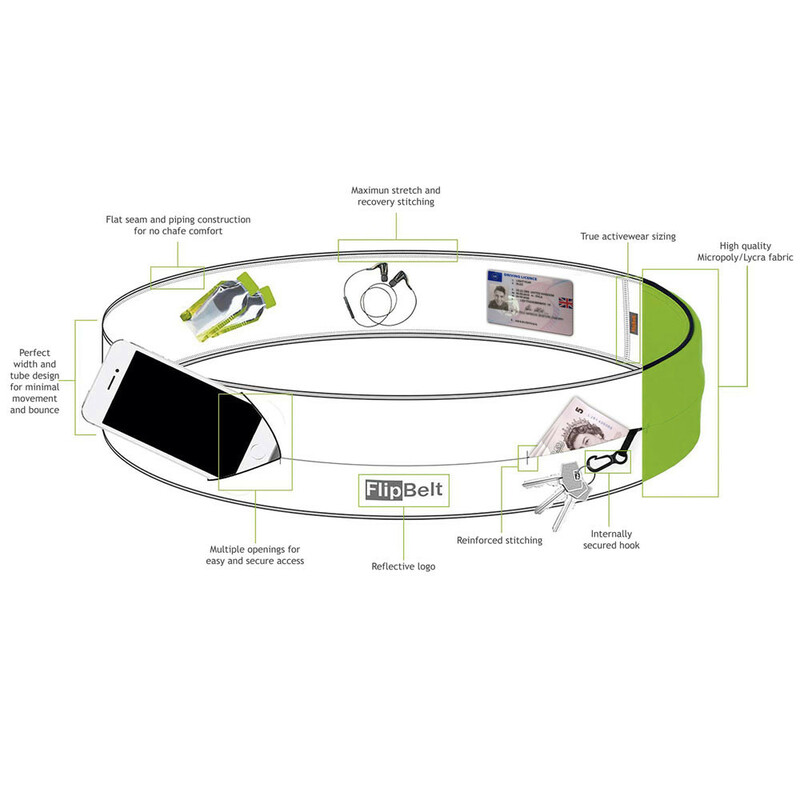 Depending on where you want to wear your FlipBelt, the size will vary. Low on your hips, go up a size. On or above your hips, go true to size. On your natural waist, go down a size. Moisture Wicking Fabric - Wicks sweat and dries incredibly fast. Internal Key Hook - For added security. Multiple Pocket Openings - For Additional Storage. 3M Reflective Logo - Enhances visibility during low-light conditions. Washing - Machine wash and dry or hang dry.